Left to right: Steven Epp, John Babbo. Photo courtesy Kevin Berne and Berkeley Repertory Theatre. The images in Robert Louis Stevenson’s 1883 book Treasure Island – the map with a big X over the buried treasure, the menacing pirate with the peg leg and parrot, the deserted island where lie the skeletons of a treacherous crew – have been irrevocably burned into the Western cultural consciousness. There have been dozens of adaptations in the past hundred years, yet it takes the touch of a director like Mary Zimmerman – a specialist in adapting larger-than-life tales to theatre – to make Stevenson’s work come to life on stage. Berkeley Rep’s production of Treasure Island cuts to the core of this swashbuckling adventure, creating a tense, riveting, and, above all, exciting play. When reviewing an adaptation of Treasure Island, one must first discuss the most important element of the story: Long John Silver, the scoundrel who singlehandedly created the pop culture pirate. Actor Steven Epp emphasizes Silver’s trickster qualities, playing him as a veteran who compensates for his age and missing leg by being five times craftier than the rest of the characters. He is also fascinatingly ambiguous, switching sides multiple times in a single scene in an attempt to balance his own greed with escaping both justice and his mutinous band of ruffians. One particular piece of social gymnastics near the end of the play is more impressive than the multi-story gunfights. The rest of the ensemble keeps up with Epp’s larger-than-life performance. Former Broadway actor John Babbo plays Jim Hawkins, teenage cabin boy and viewpoint character, with the pluck and courage one would expect from a Victorian-era protagonist. Castaway Ben Gunn (Steve Pickering) uses a boisterous physicality to punctuate his performance, dancing and leaping with joy when given his sudden redemption. My personal favorite supporting character, Squire Trelawney (Matt DeCaro), is the perfect aristocratic fop, whose loose lips and naiveté create trouble for the protagonists while the audience laughs at his bumbling demeanor. 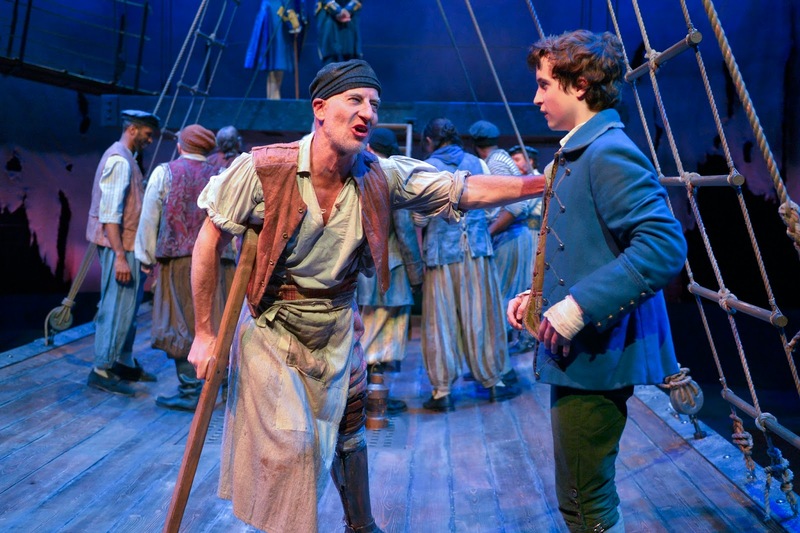 Like many of Zimmerman’s works, Treasure Island uses music, visuals, and movement to further engage the audience the way only live theatre can accomplish. Traditional sea shanties punctuate the action, furthering slow parts of the plot and adding an eerie sense of adventure to the story as a whole. Todd Rosenthal’s set, consisting of a broad curved “floor” combined with lots of rigging, serves as a blank canvas while simultaneously suggesting a connection to the British nautical tradition in every scene. The costumes, designed by Ana Kuzmanic, separate the clean and crisp British loyalists from the grimy, practical pirates, making everyone’s allegiances identifiable on sight. The most impressive part of Mary Zimmerman’s Treasure Island at Berkeley Rep is its utter sincerity. The plot is familiar to us, the characters effectively archetypes, but Zimmerman respects the source material and, except for a throwaway line where Long John Silver breaks the fourth wall, plays everything completely straight. To survive in the modern era, theatre needs the occasional injection of fun, goofy or not, and Treasure Island provides the excitement that we crave.